Manchester, N.H. – Jan. 8, 2017. Image 4, the leader in 3D experiential brand design, is pleased to celebrate the company’s 30th year of bringing brands to life. Since 1987, Image 4 has helped companies of all sizes tell stories, showcase products, and engage customers in environments that invite interaction and embody all a brand has to offer. Through authentic brand engagement, customers become devoted brand advocates, increasing membership, sales and brand connections. 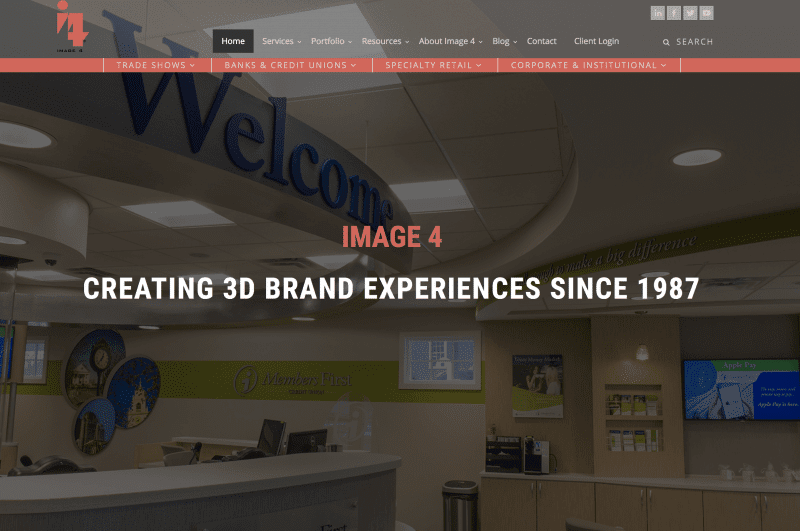 To share 30 years of thought-leadership, and show how Image 4 brings brands to life, the company has launched a new website and educational blog (www.image4.com). In today’s digital world, businesses across industries struggle to effectively connect with customers. The ability to shop for nearly anything online has eroded the traditional brand loyalty that businesses rely on to cultivate repeat customers. Customer interaction in physical spaces is precious and Image 4 focuses on helping brands to engage in meaningful conversations with customers to build long-term customer relationships and brand in the 3-D physical world. Financial institutions have contracted with Image 4 to help create brand affinity by transforming traditional transactional branch environments to become more efficient and to integrate online and personal banking experiences. Corporations across the country have asked Image 4 to transform their locations to showcase their values, connect with customers, and even enhance employee and customer engagement and satisfaction. Retailers have engaged Image 4 to help them drive sales through updated flagship locations and engaging pop-up shops or store-in-stores. Further, companies who develop sales through “face-to-face” marketing at trade shows and events have reduced the time to purchase and connected more effectively with prospects in exhibit environments optimized by Image 4. Learn more about how Image 4 can bring your brand to life at www.image4.com.